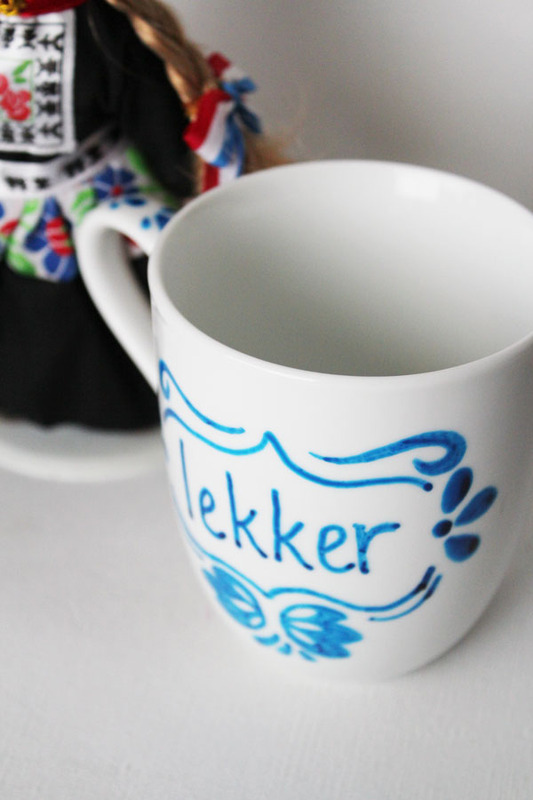 Easy to make Faux Delft Blue in just 10 Minutes! If you’re a sports fan (and even if you’re not), it is hard to miss the big football game going on… oh, excuse me… soccer. What we in the US call soccer, the rest of the world calls football (not the only confusing language twist out there – what we call “fries” the British call “chips.” And what we call “chips” they call “crisps”.) 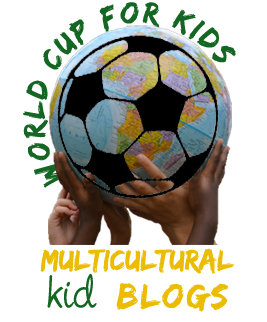 Anyway, with all the awesomeness coming together with the World Cup, I’ve partnered up with some awesome bloggers over at the Multicultural Kids blog. They pulled together an all-star cast of bloggers. Each of us is representing a country, and on each day that our country plays in the World Cup, we’re sharing something related to that country on our site. Giving you a chance to learn more about the countries you’re watching play in the World Cup. If you follow me on Instagram, you saw that I’m rooting for Team Orange. Which is the Dutch team. I’m actually Dutch – I was born in The Netherlands, and Dutch was my first language. So I’m excited to share some Dutch with you here on 30 Minute Crafts today! It might be confusing that even though the Dutch flag is red, white, and blue, that they wear orange jerseys at the World Cup (and their Olympics uniforms are orange too!). This is because The Netherlands still has a monarchy. The monarchy are descendents of the House of Orange-Nassau. Here in the US, when there is a patriotic holiday, we fly the flag. The Dutch do the same… and when the holiday also has to do with the royal family, they add an orange banner to the top. While orange may be the national color, the Dutch are also famous for another color – blue. Delft Blue to be specific. Delft Blue china is made in the city of Delft. It is white china painted with blue designs. If you go to visit The Netherlands, you can visit Delft and tour the factories where the pottery is made. Since we can’t all hop in a plane and head to Europe, I thought I’d show you a simple way that you can make your own faux Delft Blue mug. It is super simple, and only needs a few supplies. 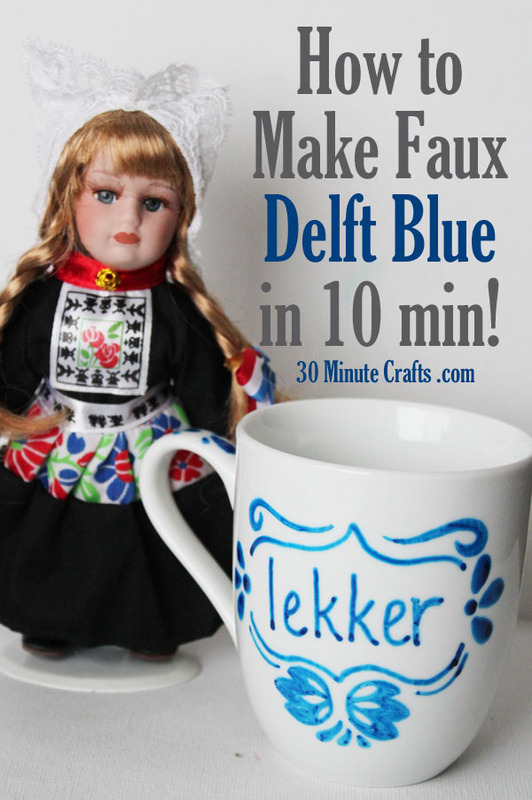 Kids will have fun making their own Delft Blue mugs to drink out of. 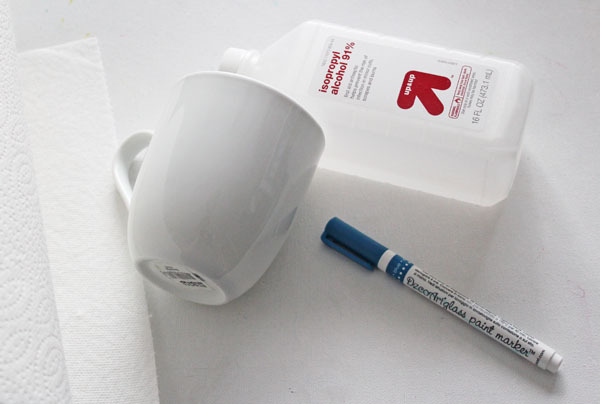 Start by cleaning your mug using the alcohol and paper towels. You want to clean off any oils and residues so that the paint can really stick. Then paint on your design. I chose the word “lekker”. Usually, when you first learn a language, you start with the swear words. 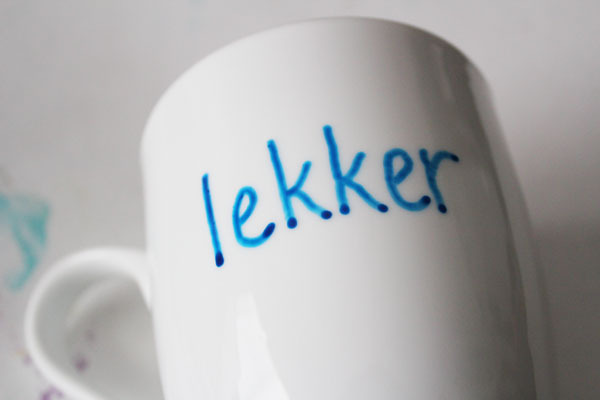 Dutch has some awesome swear words, but if you want to learn Dutch, start with lekker. It means delicious, or yummy. It can be used to describe lots of things… from food and drink to a yummy-looking soccer player! 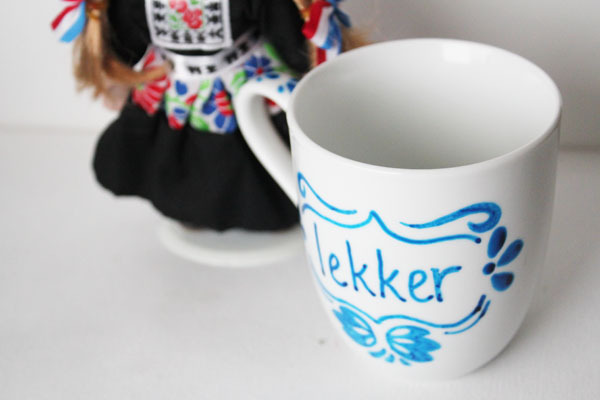 You don’t have to use a Dutch word, if you have several kids, they can each write their name or initials on their mugs. 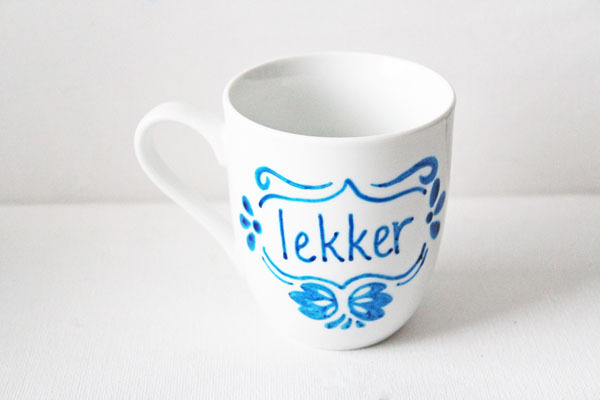 After I wrote my word, I googled images of Delft Blue designs to add some more traditional elements to my mug. Just flip through images until you find elements you like, and draw them on your mug. Once you’re done, follow the instructions to allow the paint to dry, and cure it in a hot oven. The mug will be completely dishwasher safe! Team Orange plays again on June 18th and June 23rd… come back for some more fun Dutch-themed crafting! And make sure to check out all the other awesome bloggers sharing their countries for the World Cup Series! Hahahahaha love your very “confusing” intro….football/soccer, fries/chips, etc. 🙂 On another note, I absolutely love the simplicity of making a delft blue mug! I think my little one will enjoy making this. Thanks!